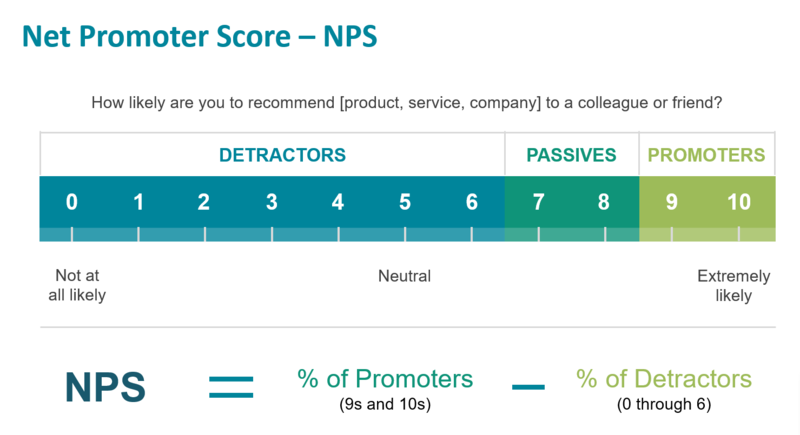 The Net Promoter Score or NPS®, was developed by Fred Reichheld and Bain & Company. Respondents are asked to respond using a 0 to 10 scale where 5 is neutral. An effective Net Promoter process is not simply based on asking employees or customers a single question and ending the survey. It is important to ask why each respondent gave you the score they did. Understanding why they scored the way they did helps to pinpoint what needs to be improved (or actions taken) to raise a score to a 9 or 10. Why do we use NPS in our surveys? NPS gives you actionable information which can be targeted for corrective action or process improvement. Understanding why an employee or customer gave you a 9 or 10 helps you to better understand your core competence. Reading through the follow-up comments from Promoters, Passives, and Detractors is the key to increasing loyalty, retention and ultimately profitable growth. The NPS methodology is more than a score. Each score represents an opportunity. Each response is tied back to a specific individual. Examining the underlying reason behind the score and developing effective solutions can convert the Passive employee or customer into a Promoter and minimise dissatisfaction. Promoters are your employees or customers who are so enthusiastic that they will proactively promote your organisation to their friends, peers, and colleagues. They will give a rating of 9 or 10. Employees or customers who give you a rating of 7 or 8 are described as Passives. They may become Promoters if you improve their overall experience, but may become Detractors if corrective action is not taken. For now, they do not factor into the NPS calculation. Detractors are those employees or customers who are not engaged with your organisation and have negative perceptions of it. They are not shy about sharing with others their plight and warning current and potential employees or customers to stay away. Detractors are those who give ratings of 6 or lower.